River Bend Ag purchased a John Deere 470G excavator late last year from Erb Equipment in Cape Girardeau, Mo. Every spring, the mighty Mississippi River is a busy thoroughfare of barges hauling all manner of goods up and down the waterway. As spring also is the time to get fertilizer to farmers for row-crop planting season, companies that move it are especially active during this part of the year. Wholesale fertilizer dealers and farmers throughout the Midwest and deep South depend on the river's barges to keep them stocked with product. For one company, River Bend Ag LLC in New Madrid, Mo., the need arose to improve the efficiency with which it unloaded fertilizer from barges at its dock on the Mississippi. River Bend Ag purchased a John Deere 470G excavator late last year from Erb Equipment in Cape Girardeau, Mo. 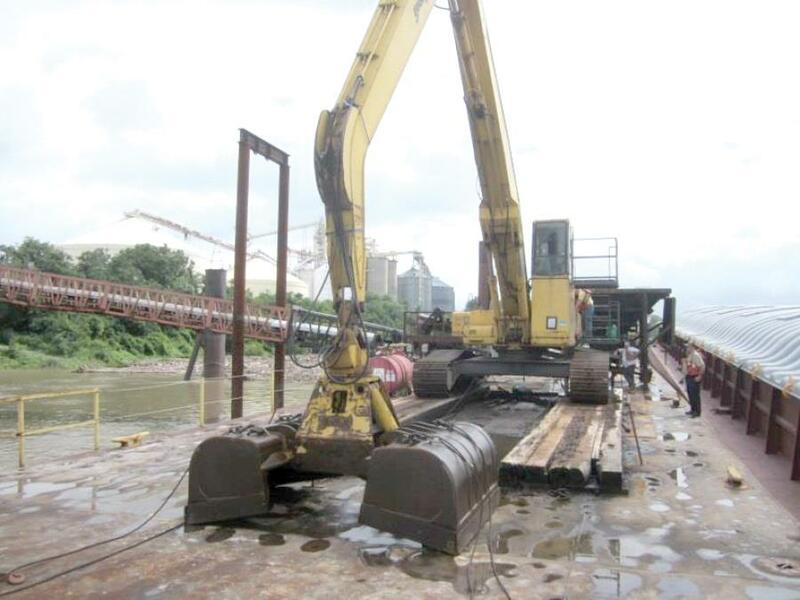 The fertilizer wholesaler bought it with the express purpose of getting it converted from a construction machine into a material handler for unloading barges and moving the contents to its own warehouse. Deere manufactures the regular boom-and-stick found on its excavators, but for River Bend Ag's purposes, a special material-handling front, or long front, was required — something Deere does not make in that size machine (a long front includes an extended boom). Luckily, River Bend Ag and its since-retired manager, Ed Barnhill, turned the problem over to Beau Cotton, a salesman they had worked with at Erb Equipment. Cotton quickly came up with a solution. Cotton and the folks at Erb Equipment decided that the best company to help River Bend Ag get the material handling application it needed for its excavator was Pierce Pacific Manufacturing, one of the country's top suppliers of attachments, work tools and machine conversions for a variety of excavators. “So I called Bob DeMeester, with Pierce Pacific, and he in turn went down to New Madrid and did a site-specific study for those guys, based on the machine they had, as well as the requirements of reach and weight capacity before putting together a nice report for them. We then quoted the machine that Bob had recommended, based on his study,” Cotton said. 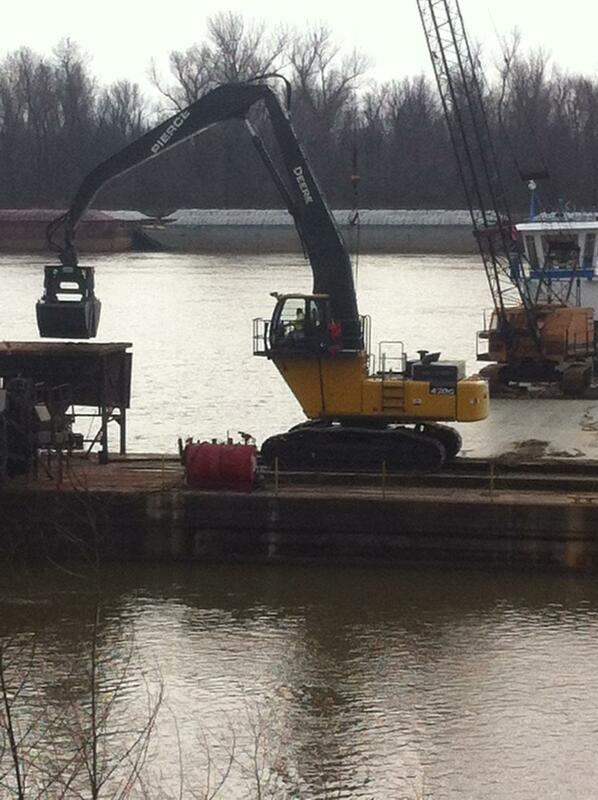 Pierce Pacific not only manufactures that specific long front with a clamshell bucket from scratch, but it sent some of its mechanics to Erb's shop in Cape Girardeau to widen the undercarriage on River Bend Ag's new excavator and add a counterweight to it in order to improve its stability for use on a barge. The newly adapted Deere 470G is the lifeblood of River Bend Ag's operation, a small, nine-employee company whose success is dependent on how well its equipment works. “We just have the one excavator that we use as a material handler on a barge, with the rest of our equipment being on-ground machines like front-end loaders,” said Josh Miller, River Bend Ag's new president and general manager in the wake of Barnhill's retirement. “Our whole business revolves around getting fertilizer moved in as efficient a way as possible. From that 50,000-ton (45,359 t) storage facility, River Bend Ag then uses its front-end loaders to place the fertilizer into 18-wheelers to take to market in a large radius that includes the southern halves of Missouri and Illinois, northern Arkansas, and western Kentucky and Tennessee. Miller said that since taking possession of the new material handler at the first of the year, it has worked exactly the way he had hoped and it has been in operation most days. The company unloads year round, but is busiest from March through June, when his crew is unloading dry-bulk fertilizers such as potash, phosphate and urea. River Bend Ag also maintains five huge tanks for storing liquid fertilizer, which it pumps directly off the barges through a pipeline. The company's river dock, warehouse and storage tanks are located on private property just southwest of the town of New Madrid and along one of the great loops of the Mississippi River in the bootheel of Missouri. The site is in a narrow strip between the river to the east and Interstate 55 to the west, making the transit of fertilizer from river to warehouse to trucks to market very efficient. Erb Equipment serves customers in southeast Missouri up through St. Louis, as well as southern Illinois, southern Indiana and western Kentucky. Besides its Cape Girardeau flagship store, its other Missouri locations are in Fenton, Foristell and Cuba. The other dealerships are in Mt. Vernon, Ill., Evansville, Ind., and in Paducah and Owensboro, Ky.